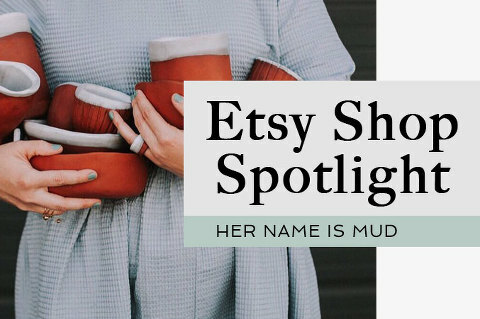 So, I actually found out about Her Name Is Mud on Etsy through Instagram, of all places! My Internet pal Molly, of Almost Makes Perfect, shared something she had snagged from Krista’s shop last year, and it took about .05 seconds for me to click over to the @hername_ismud feed for a closer look at the rest of this new-to-me artisan’s work. Long story short, it took much less than .05 seconds for me to give Krista an “official” follow on Instagram thanks to her gorgeous, bright posts, and I’ve loved everything she’s published and launched in her shop since then. Keep scrolling for a list of links to the things I currently have my eye on in the Her Name Is Mud Etsy shop. Did something special catch your eye from that list? Hop through to Etsy here because there’s sooooo much more to see. Krista’s work is really unique, and she’s got a lot of variety available, too—earrings, wall hangings, pins, functional kitchen vessels, and even cake toppers. Oh, and if you love watching the process of artists actually working with clay, then follow Krista on Instagram. She’s really good at sharing sneak peeks of her process, and I’ve learned so much from her already. I can’t wait to see what Krista does next! *By shopping the affiliate links above you’ll be supporting not one but TWO small businesses: my own and today’s featured Etsy shop spotlight. Commissioned affiliate links are not sponsored. Rest assured that I never recommend products we wouldn’t use or don’t already love ourselves. If you’re new to Dream Green DIY, then you might not know that this is more than just a one-woman show. Nikki McIntosh, the founder of Wise Apple Vintage, has been helping me with marketing for about two years now, and I can’t even fathom what work life was like before she joined me here at DGD. She helps every day to make sure you guys see new posts (and old posts, too) by scheduling things to Facebook, posting to Twitter, and making sure the blog’s Pinterest feed is also full of fun content that we think you’ll love. Nikki is a great help with administrative things around these parts, but she’s also an incredible advocate and support system for me as an entrepreneur. I always smile when I see an email from her pop up in my inbox because she has such a bright, happy personality that’s infectious. And the Etsy shop she founded and runs when she’s not working on DGD tasks is much the same way—light, colorful, and full of the types of treasures that all you fellow mid-century-modern-lovers out there will appreciate. 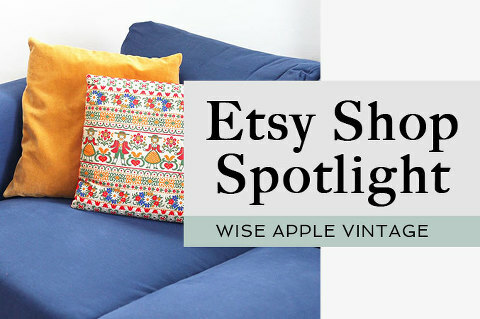 In fact, Nikki and I first connected over our love for retro home décor and accents, and I still get a thrill taking a digital wander through the Wise Apple Vintage shop each week. Keep scrolling to see what’s currently on my wish list. I honestly want to add all eight of those pieces to my cart right this second, but I’ve got to make sure I leave some goodies for you guys, too. Did you know that DGD Tribe newsletter subscribers get an exclusive discount to Nikki’s shop? Sign up here so you can get the coupon code the next time I send out a newsletter (HINT: it goes out next Wednesday). What’s your favorite piece from that list above? Let me know in the comments, then hop over to Etsy here and give the Wise Apple Vintage shop some love! If you’re anything like me, then you love cheeky sayings, bright colors, and bold silhouettes. And if that IS all, in fact, true for you, then I have little doubt that you’ll love the work of LA-based illustrator, letterer, and graphic designer Ann Shen. Below, Ann shares a peek into her process, plus details on the upcoming fall 2016 release of her first book, Bad Girls Throughout History! What lead you to start dabbling in illustration and graphic design? When did you start your Etsy shop? After working for a few years in the non-profit world post-college, I realized I was spending most of my time reading illustration and design blogs. My boyfriend-now-husband was also in school at CalArts at the time, and I saw what he was doing and really felt the calling to do it, too. So I decided to take a figure drawing class, apply to art school a few months later, and got in. I started my Etsy shop in 2011—the month right after I graduated from art school—and had no idea what I was going to do next. How would you describe your style? And how does that influence your work as an artist? My style is largely influenced by mid-century artists and designers. I love strong design work and beautiful illustrations that tell a story; some of these artists include Mary Blair, Charley Harper, Alice and Martin Provensen, Rene Gruau, and Gil Elvgren. I also love vintage things. My favorite way to spend a Sunday morning is at the flea market, discovering new-to-me old ephemera. All of that influences my work greatly as an artist; finding unexpected, appealing objects that inspire me endlessly. As a small business owner, what are your strategies for marketing? How do you get the word out about your art? The Internet has been the greatest tool invented for marketing. You can do so much without having a budget—especially through social media. A lot of my work now gets out by Instagram. I haven’t done any ad-marketing, just because it hasn’t been on my radar yet. I think about what I like seeing from my favorite artists, and I share the same way with my audience. I also do a lot of shows—both craft shows and comic con shows—to get my work out there. Tell us about your soon-to-be-published first book! My first book, Bad Girls Throughout History, is going to be an illustrated coffee table book about 100 badass women who changed the rules for everyone, everywhere. In addition to painting portraits, I researched and wrote a bit of background on every lady. It’s being published by Chronicle Books, and should be coming out fall 2016! I’m so excited to share it with the world. Working on it changed me in ways I never expected, and I hope it emboldens everyone who reads it, too. What do you wish you had known before starting out as an Etsy seller? That Etsy takes time to pick up. I hear from friends starting shops now and they get discouraged about spending a lot of time putting up a great shop and then not getting any orders. Don’t get discouraged! It’s the long game! There are definitely ebbs and flows, and that will eventually correlate to the amount of time you spend promoting your work. Just keep going! P.S. Don’t forget to take the reader survey! At the end of the questionnaire, you have the option to enter yourself in the giveaway to win a personally-curated prize pack of all of my favorite goodies! Survey this way. As a fellow art school grad, I can truly relate to Emily Reinhardt and the creative passion she has poured into her Etsy shop and brand, The Object Enthusiast. Although our paths are admittedly divergent in focus and in medium, hearing about her struggle with finding an artistic yet lucrative career post-graduation hit home in a major way. If you, too, are hoping to prove the naysayers wrong and show the world that your work is worthy of note, I hope you’ll take Emily’s words to heart! Scroll on for tons of photos of Emily’s beautiful ceramics, plus read up on the story behind her success. What lead you to start dabbling in clay? When did you start your Etsy shop? I started working in clay in 2008, purely as a 3-dimensional credit in college. I was a photo major without a direction of where I wanted to be after college, and then this introductory course in clay made me change my mind about everything. I switched my major to ceramics shortly after that first class. I graduated with my BFA from Kansas State University in 2010 and opened my Etsy shop in 2011. I love that you offer local Omaha, Nebraska shoppers free shipping—by meeting up with them at a coffee shop to hand off the goods, no less! How clever! Who is the ideal customer for your shop? I just recently started learning about my “ideal” customer (so much research goes into this stuff! ), and so far here’s what I know: typically, women are most drawn to my work, and the people who shop my items care about their home life and the objects that they surround themselves with. I like to think my customers look forward to using the objects they buy from me—almost used in ritual on a daily basis. This is just what I imagine! I really just aim to make someone’s day with my work—whether they’ve been gifted something from someone they love, or bought the vase for their favorite flowers. Tell us a little bit about Yoshi Ikeda, your professor at Kansas State University. How did he end up influencing your work? Yoshi’s been a big influencer in the way I work, more than the work itself. While he was my teacher, he had just suffered the first of many strokes in his life, and his physical health was declining. He didn’t let it stop him, he was in the studio all the time and made so much work. Only half of his body worked, and he was in the studio trucking along every single day. I started seeing his work habits and learned that I needed to put in that time to my work, too. Which is probably why I catch myself working every single day. I wish I had had a realistic view of what it looked like to be a business owner. In college, they really drilled into us that we either search hard for some sort of “art related job” or we go to grad school. They never even mentioned the possibility of turning our work into a business. I wish I had been able to have some conversations with a few “artrepreneurs” before getting into all of this. But now I hope that I can help aspiring students realize that they can make a living off of the things they make. What are your personal favorite Etsy shops? Name your top three. I love Paper and Clay ceramics made by Brit McDaniel, the shop Gypsya has gorgeous quilts, rugs and textiles and Dear Golden for women’s vintage! Gilit Cooper, of The Bannerie, is someone that constantly wows and inspires me—as in, every. single. day. She is a powerhouse creative who is ace when it comes to styling, and it turns out that she’s also a crazy talented branding master to boot (have I mentioned yet that you can hire her to help you with your own Instagram branding?!). Although Gilit’s Etsy shop is closed for the season, I couldn’t help but beg her to take part in my running Etsy Spotlight series to talk shop and to dive down deep into how she’s made such a colorful and creative name for herself. Read on for her ultra-insightful interview. When did you start your Etsy shop? What led you to decorative arts and design in the first place? I started The Bannerie a little over a year ago. Oh man, I’ve been “dabbling” in decorative arts and design for as long as I can remember! As a kid, I always loved art class the most, and would spend hours looking at all my mom’s interior design magazines, always moving the furniture around in my room and creating collages. I studied Visual Arts Management at FIT in New York, and I didn’t know exactly what I wanted to do, but I always knew I had to be around creativity without being a fine artist myself. The Bannerie came about because when I graduated, I started my blog so my name would be easily searchable as I went on a job hunt, and because I had a blog, I made crazy parties for my kids with lots of handmade décor. People kept saying I should sell it, and finally, one day I saw what was so obvious to everyone else and opened The Bannerie! How would you describe your style? And how does that influence your work as a designer/maker? My style…I guess I’ve really had to narrow that down as I’ve branded the Bannerie, and now I think of it as my brand—but it really is my style! I love bright colors (specifically, pink, blue, and yellow!) To me, they mean happiness and I love spreading joy, so if I can do that with the Bannerie, then I can feel really good about what I do. There is little more rewarding in my job than hearing from someone that a banner or product I sell made them happy, empowered them, gave them a little reminder that they’ve got this! I mean, can you imagine? Sparkly letters and flamingos! But they can be so powerful! The photography and compositions on your site are gorgeous! What are your top three tips for photographing (and styling!) sale items? Thank you so much! Quite the compliment coming from you (I feel like your readers should know I’m a huge fan of everything you do). Invest your time in figuring out how to find and capture good lighting because lighting is everything. I always use natural light, and I’d encourage non-professional photographers to do the same. Once you’ve found that magic spot, take all your photos there. Plan ahead of time—maybe even set up ahead of time if you can—and once that right light hits, just shoot everything you can. Take your social media photos like that, too, and then roll them out over time. Brand yourself. This includes the props in your photos. Do you sell jewelry? What goes with jewelry? Is it sourced from Italy? Maybe throw in easily recognizable Italian goods. What is something that complements your product without competing? Use those things and make sure the colors of your brand are present somewhere in every photo. Be recognizable and you’ll become memorable. As a small business owner, what are your strategies for marketing? How do you get the word out about your goodies? I didn’t have a marketing strategy going into this per se, but there were things that I knew were really important to me before I even opened. Packaging is big. My customers need to know that they are valued and I want them to be excited when they get a Bannerie package! It also took me a bit to find my voice, but once I did I stuck to it and that voice is the one of authenticity. Being so completely myself has really allowed me to develop my brand and create genuine relationships. People know what to expect from me: I make jokes, I love encouraging other people, and I like pretty things. As for getting the word out, in the beginning I always said yes to photographers and stylists who wanted products in exchange for photos and for giveaways, and I think that was the right move. I’m pickier now, but I’ll still do it for someone whose audience is similar and whose brand is a really good fit. Now it’s time to pitch to magazines (ahhh!). Also, Instagram is everything in marketing for no money. To learn a little bit more about Gilit and The Bannerie, click here to hop over to The Crafted Life and read Gilit’s #meetthemaker interview from earlier this year! I’m so thrilled to be welcoming Alyssa Thiel, Founder of Parris Chic Boutique, to the blog today for my Etsy Spotlight series. And I’m even more thrilled to finally meet Alyssa in person next week at the La Petite Bloom workshop in Charlotte, North Carolina! This designer and calligraphy artist has a downright beautiful story to tell about how her Etsy shop and brand came to be, and you can read it (plus snag her tips and tricks for marketing and photographing your own handmade goodies) below. When did you start your Etsy shop? I started my business back in 2012 right after my husband and I got married. The shop started on a whim after DIYing absolutely everything in our first apartment—from the furniture, to the décor and (you guessed it) the pillows! With every new craft I made for our new home, my husband encouraged me to start selling pieces. And that, my friends, is how Parris Chic Boutique was born! Is there a story behind the shop name Parris Chic Boutique? The name was just something I came up with that was special to me. ‘Parris’ with two ‘r’s (has nothing to do with the city!) was my maiden name. I loved that last name growing up, and wasn’t ready to get rid of it altogether, so I named my shop after it. I knew I wanted it to be a boutique and Parris Chic Boutique just seemed to roll right off the tongue. What lead you to start dabbling in handmade home décor? When did your designs begin to take off? Moving into my first place, I fell in love with interior design and spent most of my days pinning away pretty home décor. It was only fitting that I started making and selling things that inspire me and products that reflect what I am passionate about. When I started the Etsy shop, I couldn’t have dreamed it would become what it is today! I honestly thought it would just be a hobby that I would spend my free time working on. I think it was a good mix of the time of year that I opened my shop, and also the one-of-a-kind personalized items I was selling. Whatever it was, things started to take off right away and I quickly realized that if I dedicated the time, I could turn this hobby into a business. After focusing on my shop as a full-time business, the brand really started to form and the entire aesthetic of my home décor products dramatically changed. For the first year, I had been using generic computer-generated fonts to design my pillows, until one day I decided I wanted more. I needed something that represented me and my message as a shop on a more personal level. Soon I found my love for calligraphy and all things hand-lettered, and before I knew it, my shop was revamped with items that were one hundred percent handmade from the very beginning. It became a much better representation of the look and feel I wanted for my products: a combination of home, love, celebration and everything in between. I have put my heart and soul into my personal business and the entire shop has become a true passion of mine. I realized very early on that I would get the most out of my business by creating original work that is true to myself and letting the things I love shine through. The photography on your site is gorgeous! If you don’t mind spilling the beans, could you tell us about your process for planning and setting up a product photoshoot? Aw, thank you! I have found good photos do wonders for selling my products. My customers want to see stunning visuals that inspire them to decorate their own home. In planning product photo shoots, I try to bring the items to life and tell the story behind the products. For example, creating a large scale cozy environment even if I just want to get a good shot of a pillow or two on the couch. Showing the items in a real life situation is always the best. What are your top three tips for photographing sale items? Don’t try to do it all on your own! Find a photographer who is passionate about your brand and who can help you see the vision of not only your photoshoot, but the growth of your business. Natural light is your best friend. We’ve had to postpone product shoots for days and weeks because the sun wasn’t shining the right way or the light just wasn’t there. Don’t try to substitute the natural light with anything fake. Trust me, your products will look best in the real deal! Even if this means staging your entire set up around the biggest window in your home or studio to get that light (guilty!). Don’t just photograph your product—tell a story! No matter what you sell, you are trying to sell a lifestyle or a design style to your customers. They want to see the big picture, not just a boring snapshot of your product with a boring white background. Those photos are important for listing items, but when it comes to advertising and showing off photos to represent your brand, think big picture. Personally, at PCB we want to convey a style of cozy comfort while celebrating love. To do this, we deck out a sofa in pretty pillows, but use people and tons of comfy throw blankets to get the point across. As a small business owner, what are your strategies for marketing? How do you get the word out about your products? Besides the obvious answers (hello Instagram and Pinterest! ), collaborating with other talented business owners and creatives has been my favorite way to market my products. I love sending items to fun bloggers or being part of big group events and giveaways. Naturally, I am inspired by others in the creative world, so it is that much more fun when we can put our powers together and collaborate on something amazing! What do you wish you had known before starting out as an Etsy seller? What’s your biggest takeaway, and what piece of advice would you offer to new sellers? I’ve learned there is so much more to owning a business than creating and selling pretty things. There are so many foreign components of business that I had to learn (and am still learning) along the way to run and own a successful boutique. The best advice I ever received was to “get help!” and I’m so grateful I learned quickly to not go at this whole thing alone—owning a shop is hard work! Hiring people who are passionate about watching your business grow alongside you is so crucial. I’m now able to focus on the parts of the brand that I truly love and find joy in, rather than getting caught up in the mundane. This way, I am able to keep things fresh and exciting for our customers! P.S. Today’s the last day to enter to win my spa gift package in collaboration with She Only Lives Once to honor of my 1,000th blog post! Details this way. Don’t you just love when Internet friends become REAL LIFE friends? Rachel Smith (blogger behind The Crafted Life), and I connected on social media wayyyy back when, and finally met in person last year at the Better Homes and Gardens Stylemaker Workshop. We’ve stayed in touch and I couldn’t be more infatuated with this bubbly girl’s wit and encouragement. In addition to her blog, The Crafted Life, Rachel also is the talented artisan behind an Etsy storefront of the same name! Read on to get the scoop behind her business, her brand and a few of her own favorite Etsy sellers, too. When did you start your Etsy shop? Is there a story behind your shop/blog name, The Crafted Life? I’ve dabbled in selling a few things on Etsy in the past—watercolor gift tags, wooden bead necklaces, amongst other items—but officially opened it with a clear vision in September 2014. The name of my shop is actually the name of my DIY and craft blog and is an extension of it. What lead you to woodworking, and specifically, what made you decide to make these types of photo holders? When did your designs begin to take off? I spent a few weeks over the summer in 2014 at my boyfriend’s mom’s house. She’s a carpenter and has an amazing assortment of tools. One of the things she taught me during that time was how to use the scroll saw (what I use to make the photo holders). I originally shared the photo holders as a tutorial on my blog and just decided to sell them after the response I received. I’d say that sales started to pick up around the holidays (November and December). I also sold at a craft fair here in Portland, which led to my first wholesale order. How would you describe your style? And how does that influence your work as an artisan/artist? I am all about color and interesting shapes/patterns. I love incorporating color blocking into my photo holders and hope to maybe even introduce patterns soon. What do you wish you had known before starting out as an Etsy seller? What’s your biggest takeaway? Great question. I really wish I knew about commercial shipping rates before I did. It saves a ton of time and money—not to mention trips to the post office—if you are able to weigh and print your own labels through Etsy’s system. My biggest takeaway is to make sure your product is unique. There are tons of sellers on Etsy, so what are you doing to make your brand and product stick out? It helps to have other outlets to let people know about your shop. Instagram is by far my favorite. Also, invest in good photography (either learn it or hire someone). It will change your sales tremendously! P.S. I have two giveaways going on Dream Green DIY this week. First, you still have time to enter the Kate Aspen party supply giveaway, and as of yesterday, you can enter to win $50 to Barn & Willow. Good luck! For my last day of vacation, I wanted to share a brand new Etsy Spotlight feature with you. I’m thrilled to welcome Brittany Castellano, of A Handcrafted Home, to the blog and could hardly wait to share her mini interview with you. This feature is a true testament to the power of social media—I found Brittany through a few chance Instagram interactions, and have been a big fan of her work ever since. I hope you enjoy learning a little more about this uber talented designer and successful Etsy seller. When did you open your Etsy shop? What lead you to start designing these types of graphic pieces? I opened my Etsy shop in 2011. My husband and I had just bought our first house. We couldn’t really afford to buy a lot of new stuff, so I got busy working hard by refinishing and reupholstering furniture for our home. I loved the process of giving old items new life, so even after my home was fully furnished, I kept fixing up old pieces and eventually opened an Etsy shop to sell them. I made a couple of sales and I realized that shipping large pieces of furniture was more challenging than I anticipated. Have you ever tried to ship a giant wingback chair from LA to Boston? It’s not as fun as it sounds. Anyway, after I sold a few pieces, moved furniture all around town to craft shows and filled my garage with more wingbacks than I’d care to admit, I decided that this type of business was not for me. I eventually paused my furniture refinishing, but I still really loved being creative and I was always looking for new ideas for my shop. One day, I was looking for some new pillows and art prints for my home, when I decided to design some myself. I wanted my home to feel happy, which is why I focused on colorful hues and graphic patterns for the designs. I ended up listing some of the items in my Etsy shop and everything just grew from there. Now, everything I create for my shop has that same vision for my home in mind—they’re designed to make your home happy. How would you describe your style? And how does that influence your work as an artist? Where do you find your inspiration? I would describe my style as modern, colorful and feminine. I think that the different pieces I create fall within one or all of these three categories. I find inspiration everywhere. I know that is a cliché answer, but it is true. Inspiration can come just from going for a walk, watching a movie, reading a blog or even reading a book. Anything can spark creativity. Sometimes, taking a break can lead to even more creativity. The photography on your site is gorgeous! What camera do you use? What are your top three tips for photographing sale items? Who is your model? Thank you so much for the compliments on my photos. I’ve come to learn over the past couple of years how vital photography is for the success of any online business. Because the customers can’t see the products in person, they rely on the photos to tell them everything they would otherwise be able to see in a store. However, photography is not easy for me. Thankfully, I have had a lot of help with my photos. My sister-in-law helps by taking my product photos for me, my friend Kelsey graciously gave up an afternoon to come over and model with my items and my friends Felishia and Natasha help with photo styling. Use natural light: This really makes your photos look the best. Plan Ahead: Make a list of all of the shots you want to get and figure out what props you want to use. Maybe even do a few test shoots ahead of time to see if you like the lighting or if you want to use different props. There is nothing worse than having a big shoot and then afterwards wishing you would have gotten a certain shot or realizing that you didn’t really like the styling. Also, keep adjusting as you go until you get the shots you want. Educate yourself on the basics: If you’re not confident about product photography or don’t know where to begin, there are a lot of helpful courses through Creative Live and Skillshare that can really help your photography. Classes like these have been incredibly helpful for me to learn the basics since photography is not easy for me. Who are some of your personal favorite Etsy sellers? Lisa Congdon: She is an amazing abstract artist, illustrator and author. LaLisette: They make the cutest fruit handbags. Quill & Fox: I love their handpainted illustrations. Juju Just: They carry very colorful wall hangings and mobiles. Kindah: I love her handpainted patterns. Living and working out of Southern California sounds just dreamy. How does LA influence your brand and designs? What are your top three places to shop (or eat!) in LA? I absolutely love living in Southern California. I think living here definitely inspires a lot of the designs for my shop. LA is a very colorful, vibrant place and I think living here has had a tremendous influence on my designs. The creative community in LA is huge here, which I think has really given me a lot of opportunities that I wouldn’t have had living somewhere else. There is so much support for makers here in LA, and there are creative events happening every weekend that give the LA creative community a chance to connect with one another. Tell us about your favorite piece in the A Handcrafted Home shop. What makes it so special to you? This is a really tough question. All of my pieces are so special to me because I’ve spent so much time working on them. I think my favorite piece is the teal & red geometric print (pictured below). It was the first print I ever created when I re-launched my shop. I never, ever thought I was even capable of designing prints or textiles—it was just an idea that I had—so I started out with this one print. Eventually this print was featured on Refinery29, which opened a lot of doors for my business that I never even dreamed of. This print is my favorite because it is was the beginning of the change that shaped my business into what it is today. For more of Brittany’s beautiful collection, click through to A Handcrafted Home on Etsy. Every now and then I’m reminded of what a small world it is—case in point, my latest creative connection with Alisha Johns, the talented artist and Etsy seller behind lishylishy. When her name popped up in my inbox, I quickly hopped over to her social accounts to see what was up with this new-to-me brand. Suffice it to say, I was blown away to find out that Alisha actually went to the same college as my little sister, and lived just an hour or so away from me while there. It didn’t take long for me to excitedly reply to Alisha, and we started hatching a plan for today’s Etsy Spotlight feature. Read on to get the scoop on this colorful, creative artist and find out what it means to her to be a part of the Etsy family of sellers and makers. When did you start your Etsy shop? Is there a story behind the shop name lishylishy? What lead you to start dabbling in painting? When did your designs begin to take off? My love for painting actually started with a love for pottery! I spent a lot of time in my high school ceramics classroom and always found both wheel throwing and painting my pieces to be a great source of stress relief. In college, I didn’t have a wheel at my disposal, but I was able to continue painting. Once I launched lishylishy, my designs started to take off when I was noticed by Jana Bek Designs & Abby M. Interiors on Instagram. Jana used my cupcake and ice cream cone print in a room design that was featured on the PB Teen Blog, and Abby M. commissioned me for a gold-beaked flamingo for one of her clients. More recently, I submitted my work to BRIKA and they selected me as an artist! My collection will debut on their site this month. I love bringing color and whimsy to the every day. I’ve been particularly drawn to yummy sweet treats, like cupcakes, ice cream and donuts, which is ironic because I’m actually gluten and dairy free! I joke that since I can’t eat any of these goodies, I resort to painting them! I also draw a lot of inspiration from the colors of Cinque Terre, Italy, which is my favorite destination from my study abroad trip during college. As a small business owner, what are your strategies for marketing? How do you get the word out about your designs/products? I market lishylishy entirely through Instagram. I’ve worked hard to organically build a community of like-minded brand advocates, and I partner with bloggers and tastemakers on giveaways and features to further my reach within these communities. I love building relationships with my community members and just about every major opportunity that has come my way has been through Instagram! What do you wish you had known before starting out as an Etsy seller? What’s your biggest takeaway? What piece of advice would you offer to new sellers? I wish I would’ve trusted myself and my brand enough to reach out to retailers sooner! There’s so much potential when you put yourself out there and share your line. Don’t be afraid to ask for feedback and be sure to follow up—people may surprise you! I also would encourage new sellers to invest in packaging—it is a great way to differentiate your products, build your brand and encourage repeat purchases. I’ve connected with all three of these women through Instagram, and am continually amazed by their creativity! I’m excited to continue my Etsy Spotlight series with an interview featuring Kelli Avila, of drop it MODERN. I actually came across this bright and happy Etsy shop while building a past Spaces + Soirée + Style feature way back when, and couldn’t help but reach out to Kelli in order to keep the fun going. Stay tuned for a bigger collaboration with the drop it MODERN team later this summer, but in the meantime here’s a little background on the creative brand from Kelli herself. Tell us how drop it MODERN came to be. When did it launch? Can you take us briefly through the timeline of how you went from “vision” to “reality”? Drop it MODERN started as a small photography fabric backdrop business in April of 2008, and was based out of a garage owned by our founder Breanne. She began as a young photographer with the goal of finding ways to modernize her studio set up. She knew that if her photography business was going to succeed, she had to do something unique to stand apart from the crowd, and that was not going to happen with outdated backdrops and mediocre props. She realized it was time to take matters into her own hands, and that is exactly what she did. She found that the fabrics and designs offered in the photography world were sorely outdated so she decided to take it to the next level and began making them herself. Since Breanne is drawn to rich colors and modern graphics, she decided to incorporate that into her photography backdrops. After a couple weeks of shooting with her new backdrops, it became very apparent that her idea to experiment with prints was catching on. Photographers began inquiring about where she’d found her unique backdrops and her clients were raving about the fresh photos she was producing. Breanne’s elegant, yet edgy use of color and graphics were starting to make their mark in the design world. Since 2008, drop it MODERN has moved out of Breanne’s garage and it now operates out of her central California warehouse. How did you and Breanne develop the concept and branding of your business, including name, types of collections and design? How many of these visual aspects are a reflection of you and the team, on a personal level? The branding of the business has evolved just as the business has. Breanne is in love with all things modern, white and clean. The most recent updates to drop it MODERN’S branding was a collaboration with MaeMae & Co. We spent some time with them, pulling together our favorite fonts, color palettes, images, decor, designers, photographers—anything from a water color painting, to a room decorated by Kelly Wearstler was used as inspiration. What MaeMae was able to curate from that was beyond our imagination. We are so proud of the drop it MODERN website and really feel like it’s a true representation of our team. Fast forward to today, and drop it MODERN is thriving, with a booming Internet presence and fan following. How do you and Breanne manage it all? Describe the culture of (and team behind) drop it MODERN. The team is made of Breanne Schaap and myself, Kelli Avila. We mostly tag-team everything, although Breanne typically spearheads product development and production, while I tend to the opperational needs of the company—especially customer service and marketing. We’re moms and appreciate quality of life, so it’s a juggle to meet the needs of the business and also our family’s with such a small team. After seven years, we’ve been able to streamline things for simplicity. The atmosphere at the office is fast and furious. We try to work diligently so we can go home and participate in life with our families. I’d say that coffee and a good 90’s pop playlist are what powers us. The drop it MODERN shop features everything from backdrops and balloons, to pretty paper products and home decor pieces. How do you decide what to include in each collection? We consider ourselves to be a well-balanced representation of our customer base, so we try to make products that we use in our own photography businesses and lives. While backdrops are the foundation of drop it MODERN, there are so many other items used alongside them. If you could design your dream party, what would it look like? Sequins would most def be involved! There would likely be a photo booth with our gold sequins backdrop layered with tassel garlands. Champaign would be flowing (probably into a Kittens Get Thirsty Too cup from Ban.do). The vibe would be modern and fun with a splash of boho—maybe Bri Emery would style it! We’d have the Bon Puf cart serving up glittery cotton candy. The guest list would be fairly small—we love intimate settings with room for good conversation. What three words sum up the vibe and visuals of drop it MODERN? How do you define your creativity? I’d say the creativity behind drop it MODERN is multi-faceted—just as the minds behind it are.